Our four wheel alignment centre is one of the best in the country, we have a dedicated alignment bay fitted with the latest alignment technology ‘Hunter Wheel Alignment Systems’, Correct alignment is very important as it can effect the life of your tyres, vehicle handling and fuel economy. The modern car is built for comfort, performance and handling. In order to achieve and maintain the best ride possible, the steering and suspension needs to be measured and adjusted within the motor manufacturer’s specifications. This can only be done by measuring all four wheels and having a proper full four wheel alignment measurement. If only the fonts are set straight, through having a tracking, two wheel alignment or Toe & Go, and the rear wheels remain out of alignment (and not adjusted), your car could still suffer tyre wear, pulling and crooked steering wheel. We can also perform specialist set ups for the car enthusiasts with camber adjustments for track or fast road set ups. Imported and vintage vehicles, not a problem. Uneven tyre wear on the fronts or the rears If you can’t visibly see the wear, run your hands over the tyre and you can soon feel where the rubber has worn excessively, on the inside or outside edges. Warning – Be careful, in extreme cases of excessive wear fine wire may be protruding from the rubber. The car pulls to the left and right When driving along a straight flat road and you either need to compensate through the steering to keep the car driving straight the car drifts to the left or right under braking. A crooked steering wheel The steering wheel is not straight, even when driving straight. Tracking was born of a bygone era, when cars had very little or no adjustment. Any measurement and adjustment tended to be on the front wheels, for the ‘Toe’ angle only. Tracking on the fronts (sometimes called a ‘two wheel alignment’) does not take in account the direction in which the rear wheels are pointing. So if you have the fronts adjusted and set straight, if the rears are out of alignment, the car may pull and tyres could still wear. In its original sense, Tracking uses gauges (usually the hang-on style) where the operator peers through a ‘scope’ or views a light/laser beam on a scale. This system does not allow for run out compensation (taking account for any errors in the wheel rim), so the reading result can only at best be approximate. The black arrow indicates by how much the angle it is in or out of the motor manufacturers specification. The exact angle measurement figures are displayed centrally in the coloured bar. The small figures in the top left and right of the bar, are the to and from tolerances of the motor manufacturer specifications. 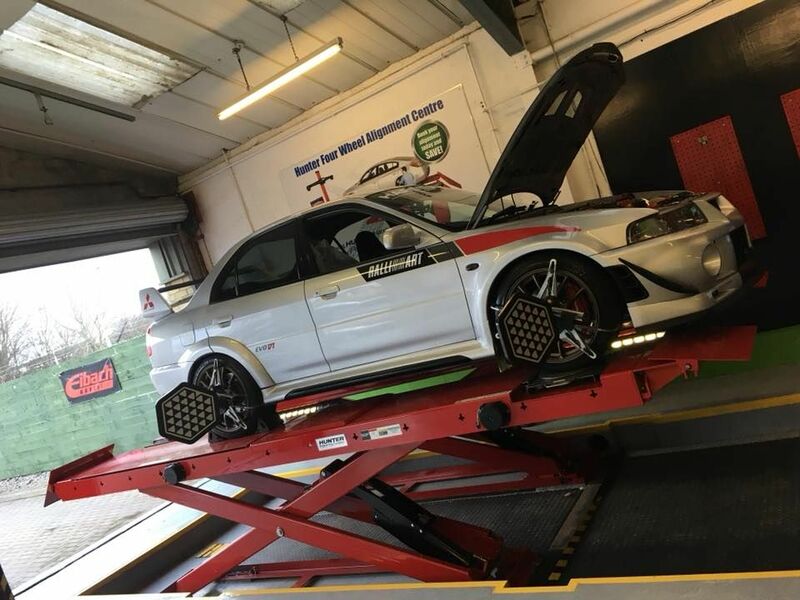 We have invested in the best possible equipment and have two dedicated wheel alignment technicians with great experience and have been trained directly by Hunter's UK team Pro-Align.